Like some of the other adult ballerinas I know, I both crochet and knit. I’ve crocheted myself a few pairs of failed legwarmers. They always end up too short and slip like crazy if I actually try to wear them with ballet. I’m forever jealous of these wonderful looking legwarmers made by Knit Two, Pointe Two, Bake Two Together. Her pattern is here, and I’m tempted to break out my knitting needles to make them. However, I’ve been searching for good patterns to crochet (I’m better at crocheting than I am at knitting) and I stumbled upon these, the Draft Dodger Legwarmers. Besides having a pun-y name, The cuffs at the top and the bottom made me think, even though these don’t contain elastic, they might not slip. I’m still working on them (they’re really long–if you’re considering making them I’d think about cutting back on how many stitches you start out with), but I’ll let you know how they turn out. 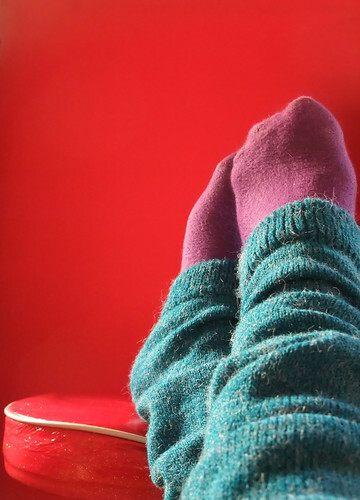 Have you made your own legwarmers? How’d they turn out? The Bambu Legwarmers I admire so much. As it gets colder and colder in Pennsylvania, my ballet instructor keeps stressing the importance of picking up some legwarmers (or cutting the toes off a pair of long socks) so that our ankles can stay nice and warm. I’ve been rocking legwarmers since summer (even though it was ridiculously hot–I’ve had some ankle troubles), so I own about four pairs of legwarmers, and I’m some of which have been picked up from dance stores, others of which I’ve picked up from stores like Target. I even picked up a pair of pretty purple ones from Burlington Coat Factory for $6 dollars (a steal, even if they are a little short for my taste). The Body Wrapper Legwarmers I’ll be picking up after Christmas, which are only a tenth of the cost of the others. My current favorite pair is a pair of long Harmonie ones that I bought over the summer from the Rosin Box (it was one of the only pairs they have, because, you know, who buys legwarmers in the middle of summer? ), however I find that sometimes they slip a little around my knees, but for the price, they aren’t bad. I’ve fallen in love with these echauffe leg warmers, and how they closely hug your leg and won’t slip, as well as the wide variety of colors they come in. However, they’re a bit steep at $80 per pair. So I’ll probably be picking up a pair of these from Discount Dance or Amazon. They look like they’ll serve about the same purpose and not fall down easily, but they’re made of more of a warm-knitted material instead of the Bamboo yarn of the echauffe legwarmers. Do you rock legwarmers year round like I do? What is your favorite pair?